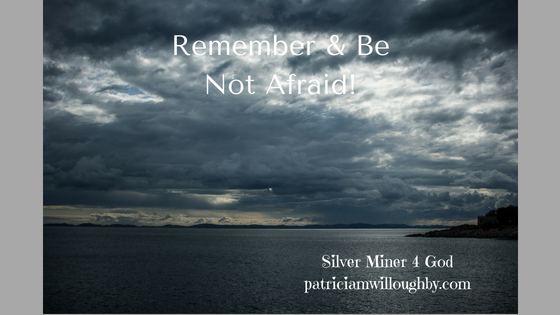 Remember & Not Be Afraid! Last Sunday’s sermon was titled “Distributing Multiplied Blessings” based on Mark 6:30-44. Today’s sermon picked up where we left off from last week, Mark 6:45-50. What struck me about this week’s sermon is that the disciples did not remember the miracle that Jesus had done earlier that day. Pastor Crowe, asked us to write down what makes us afraid. He gave his own example of being afraid of the dark when he was younger and how his brother revealed that there was nothing to afraid of once he turned on the light. Jesus is our light therefore, we have nothing to fear. For me, this sermon spoke to me about remembering what Jesus has done for me and not being afraid of my storms. I know that it is not easy to remember the goodness of the Lord when I am in a storm. But if I stop and take time to remember that Jesus is more than able to do all and more than I can ask, I can trust that He will see me through to the other side of my storm. I so much want to live by this motto; come what may I will be okay for the Lord is with me. However, I know that this is easier said than done. There have been many times in my life that God has seen me through the storms in my life and I know there will be more. Yet, I will probably be afraid when they come just as the disciples were in their storm. Lord God, help me to remember Your goodness when storms come my way. Amen. What has the Lord done in your life that you can remember to help you through your storms? How remembering what Jesus has already done can help us weather our storms in this life.